Be warned of bait-and-switch; well not exactly bait-and-switch, probably “bait without telling the full truth” namely be sure that the lens hood is included. Lens hoods are excessively priced. And yes, you do need a lens hood (to keep sunlight out of the lens). I list only lenses for full-frame sensors. The EF-S 60mm f/2.8 Macro USM is only for cameras with no full-frame sensor. Actual mm is 96mm. The advantage of a camera with no full-frame is that these can (supposedly) be better at macro and better at telephoto precisely because of the reduction factor. But a camera with a sensor that is not full sized can’t take adequate architectural or adequate wide-angle photos (due to the reduction size clipping off both the left and the right parts of your photograph). I don’t use the EF 100mm f/2.8L Macro IS USM because I do not need image stabilization. I once was photographing on the Greek island of Hydra, and the photographer with me said he would never need a tripod because his Canon camera had IS. But that evening, as we compared results, he politely admitted that my photographs (using a tripod) were consistently sharper and that his photographs were not as sharp. When you are out in a small boat, and using a tripod is not realistic (vibration from the motor would nullify the benefit of the tripod), then image stabilization is essential. But you will always get a better shot if you have a tripod. Pardon me, but I wonder how much macro photography he really does, and most telling, what in the world are his criteria for a “stunning close-up shot”. Thousands enjoy macro-photography as a hobby. Others use digital camera macro systems for scientific photography. Here at FLAAR we evaluate and review macro photography lenses, lighting, bellows, and accessories since we are dedicated to photography in Mayan archaeology, ethno-botany, and ethno-zoology. Scientists all around the world need macro photography lenses, bellows, lighting and accessories to photograph machine parts, wear and tear, medical evidence, forensic evidence, and lots of other needs in science. Our goal is to assist everyone to learning which kinds of camera equipment are best for your needs. I could not find these listed or described on the Canon web site, except in their app page on close-up (finding it was by pure chance; nowhere in the Canon site itself; I stumbled on it via Google). Extender EF 1.4x II, tele extender turns the 180mm Macro lens into close to 250mm. This I definitely wish to try. Downside of tele-extenders is that they may require manual focus. The 2x accessory may make the viewer so dark that it’s tough to focus manually, and cut down sharply on light. So if you have a tripod these are okay. But hand-held a 2x extender is not the way to go: you need a prime lens (non-zoom and non-accessorized). These are hollow adapters; no glass whatsoever. These screw into your camera and then you put the lens onto them. Their sole purpose is to move the lens glass further out in front, in order to make the image larger. When would I need this? 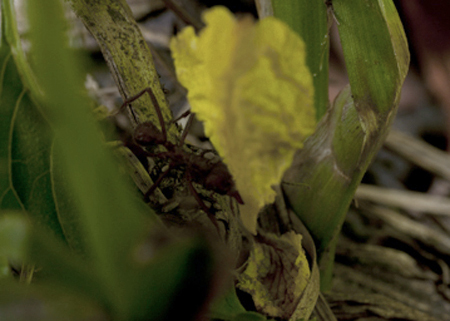 Often out in the jungle rain forests of Guatemala, I find leaf-cutting ants which are carrying flowers instead of leaves. 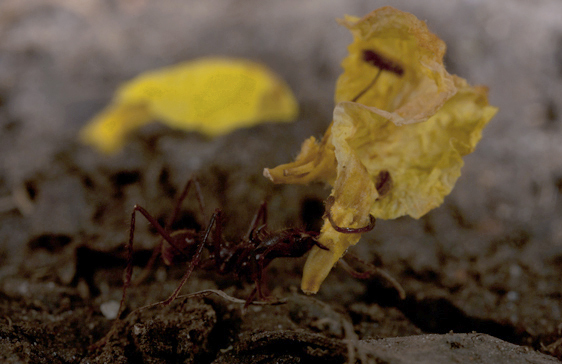 Since we at FLAAR do both ethno-botanical and ethno-zoological work, here is a double question: the zoology of the ant and the botany of the flower. I can photograph the ant with any good macro lens (good luck stopping the fast-moving hard-working ants). But how do I photograph the flowers of the vine? My biologist back in the FLAAR office needs to see the leaves and the flower of any plant that we need to identify. I can’t collect specimens since the flowers and most leaves are high above the jungle canopy. 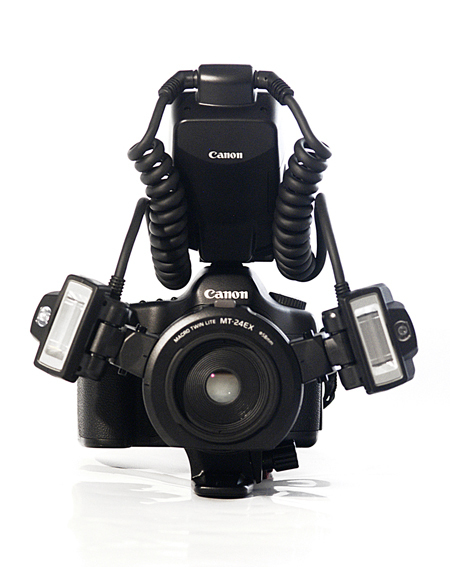 So here is a situation where the Canon 500D would be essential. Extension tubes would eliminate auto-focus and would make the view too dark to see for manual focus. Although the 500D close-up lens adapter is listed for lenses 70mm through 300mm, I have seen mention of its use with the Canon EF 100-400mm f/4.5-5.6 L IS USM lens. Filter size of the 100-400mm zoom lens is 77mm, so the 500D close-up lens will fit. I have been told you can also use selected Schneider or Rodenstock enlarging lens on a bellows. What about a bellows for macro photography? When I began doing macro photography, circa 1965, in the jungles of Guatemala, you could get special lenses to go into a focusing bellows. Leica made one; Hasselblad also had a system for their Zeiss lenses. This was at age 19, while a student at Harvard but doing archaeological volunteer work at the Tikal Project of the University of Pennsylvania. But nowadays there are not many new lenses made for a focusing bellows (though surely lots are for sale used). The older Canon FLM 100mm f/4.0 lens, 20mm and 35mm. (mir.com.my has good tips). I have also been told that some enlarging lenses from Schneider or Rodenstock can be fit onto bellows and make good macro lenses. Or you can reverse your lenses (turn them around). You need an adapter for this. 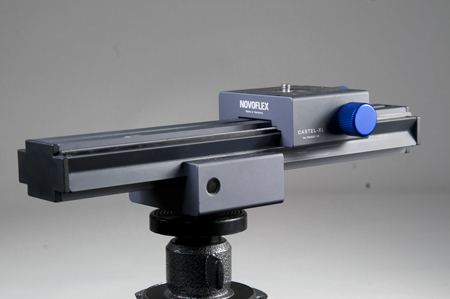 Novoflex offers precision quality lens reverse adapters. 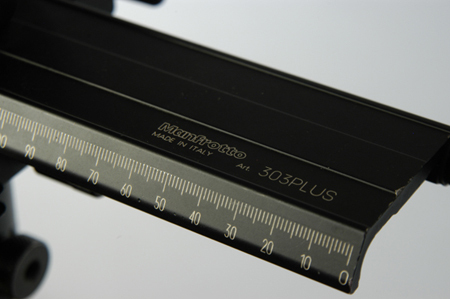 When you wish to do continuous focus, you will need a focusing rail. And not just any brand. Some brands have too much impreciseness: they flip and flop and wiggle. 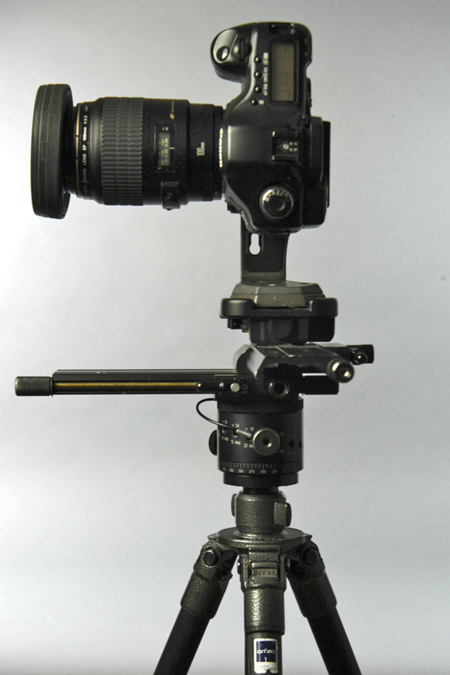 We have also used Bogen or Manfrotto focusing rails on a tripod head. The advantage of a 100mm macro compared with a 50mm or 60mm is that with the 100mm macro you are further away from the flower or insect. By being further away it is easier to focus, and much easier to get light on the subject without the front of the camera lens being in the way. Ringlight for macro photography, yea or nay? Canon offers their Macro Ring Lite MR-14EX flash. You might also look at the Novoflex Ring Flash. Macro Flash system, yea or nay? Yes, we have had a Macro Twin Lite MT-24EX for several years. We would also suggest you look at Novoflex close-up macro flash systems. 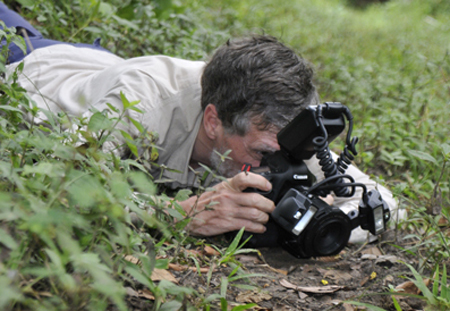 We thank John Lorusso, Parrot Digigraphic, for providing the 180mm tele-macro lens and the EOS 1Ds-Mark III camera. Our Canon MP-E 65mm macro lens for stacked focus I have had since 2007. Our Canon 100mm macro lens since about that year also. Wide-angle macro would be awkward in most situations, as you would need to get the camera rather close. But several photographers and websites have suggested that you can get remarkable views of plants and flowers with wide-angle lenses up inside the plant, flower, or tree. This is something I would like to experiment with. Every year I try something new and different (I have been photographing since age 16; my photos were published by National Geographic circa 1977 and by Japanese coffee table art books in the late 1990’s. 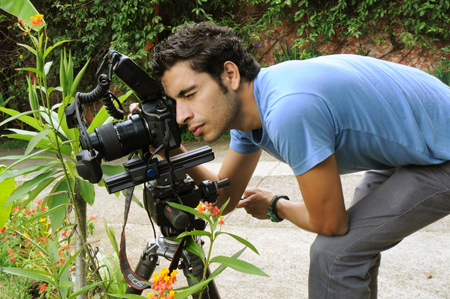 I am still doing extensive photography today, in 2011: mostly in remote parts of Guatemala, Central America. See our www.maya-archaeology.org. First posted, January 12, 2011.